This large overlap shed is an excellent choice for a good sized modern garden. After all, keeping a garden in perfect shape takes a lot of tools and equipment, and with this shed in place they’ll always be close at hand. It’s easy to construct, and yet offers a large storage capacity for a price that is hard to beat. Once up, you’ll want a building that lasts, and this is where this shed really delivers. Thanks to the extensive use of pressure treatment, the manufacturer’s have been able to give a 15 year guarantee against rot. That shows the confidence that Shed-Plus have in both the quality of materials used, and the effectiveness of the initial treatment process. It’s a confidence that we share, although we would recommend giving extra protection to the floor through the use of a shed base kit. 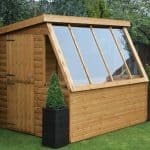 Garden sheds are exposed to all weather types, so protection against the elements is an important factor. The apex roof combined with solid overlap cladding help to keep rainwater outside, and the contents dry within. Extra security should be added in the form of a padlock, but once that’s done this shed will give you peace of mind for years ahead. When viewing this shed the first thing we were struck by was its size. The bare dimensions of 8 feet by 6 feet are enhanced by the apex roof, giving it a large storage volume and therefore advanced flexibility. It could easily be used to store bicycles as well as the standard lawn mowers, rakes, and spades. The roof is made from solid sheet OSB, which gives enhanced durability while keeping costs down for consumers. The green mineral felt covering seemed stronger than some found on low cost sheds, so it should stand up well to rain and snow. At its peak the roof has a height of 2.14m and the eaves height is 1.54m. There’s lots of room for maneuver in this shed, with a depth of 2.42m and a width of 2.03 including the overhang. We found that the overlap cladding used on this shed, at 8mm thick and allied to a standard frame, felt reassuringly strong when constructed, although it doesn’t offer the rigidity that shiplap cladding does. It has a pleasantly rustic look, making the most of a classic design that’s been beautifying gardens for decades. Overlap cladding such as this is also great at stopping ingress of water, as rain bounces off or is channelled harmlessly away. When reviewing a shed we always like to walk up and down on it as much as possible, to see what feedback we get. There was noticeably a little give in this floor, made like the roof from OSB, although it still felt secure. Because of its size, some people may think of using this shed to store heavy machinery or even motorbikes, and we would recommend strengthening the floor if this was to be done. 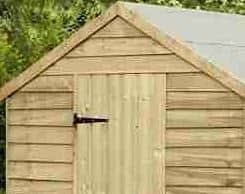 Without proper treatment a beautiful looking shed can quickly become rotten and weakened, and so we were pleased to note that all the timbers on this shed had been subjected to a pressure treatment. This is where the substrate is placed into a vacuum chamber which is then flooded with preservative that is forced deep into the timber itself. It means that the preservative treatment is effective throughout all of the timber rather than being just a surface protection. You can expect this treatment to keep rot away for a long time, which is why the manufacturer has provided a 15 year warranty. The guarantee doesn’t stipulate that annual or biannual treatment is required by the shed owner, which can add up to a significant saving over the years. We would still, however, advise checking the shed each spring to see if extra preservative treatment may be required. The single door is centrally set, and attached by solid looking hinges. It also features a hasp and staple lock as standard, but there is no padlock included. There is a dual window on the side panel, which means that the shed can be used without the need for artificial lighting. This is especially useful in a shed of this size, because it will make things easier for you to find without the inconvenience of having to use a torch. If security is one of your main concerns then you’ll need to purchase additional extras such as a padlock and shed alarm. The hasp and staple is padlock ready, and feels well secured to the body of the shed itself. The glazing is 1.5mm thick, and as it’s made of styrene it is resistant to shattering and initial impacts. This in itself can help to keep shed thieves away, as any resistance can see them move on to find easier targets. 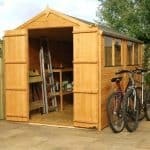 When we review a shed with large dimensions such as this one, one of our first concerns is with the floor. The greater the floor’s surface area, the more opportunity moisture rising naturally from the ground has to work its way into the substrate, and once in it can quickly spread. That’s why we were pleased to see that there is a shed base kit readily available. Made to the exact same dimensions, it raises the shed above ground level, giving it a solid and level foundation away from ground moisture. 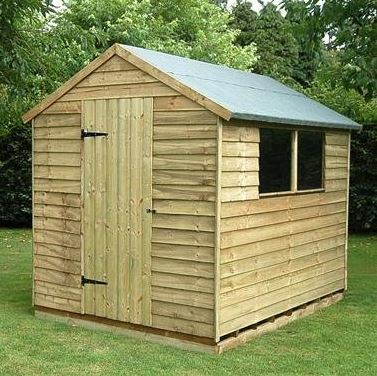 Extra security is always a smart buy for any shed, especially one which only comes with a hasp and staple. Thankfully, there are two padlock systems available, both are reasonably priced and also feature an alarm which will alert you and passers by if anything is amiss. Shed hooks can be much more useful than many people imagine, and a set of four can be purchased for this shed. They are very versatile features, and can be used to hang everything from a trowel to pot plants and hanging baskets. 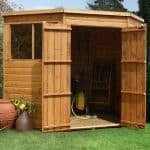 It’s a pleasant way to add a personal touch to your garden shed without having to incur a substantial outlay. 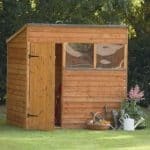 For a large shed at such an affordable price, this features components of a very high quality. The floor is adequate for everyday use, but may need strengthening if you plan to store heavy equipment. The pressure treatment used on the timbers is so effective that the shed is guaranteed against rot for 15 years, so the buyer can relax and enjoy their new purchase. Shed-Plus make a wide range of sheds, but this is their largest model. The already generous dimensions are further supplemented by the tall apex roof. With a shed of this side, it’s paramount that the instructions are clear and easy to follow. 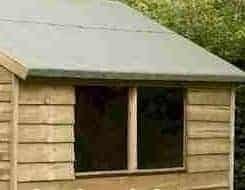 Thankfully, on this occasion they were, and with the help of a friend you can expect to fully install this shed within three to four hours. 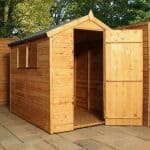 The price of the shed has been kept down by the use of OSB for the floor and roof, and overlap cladding, yet the quality of these components and the long anti-rot guarantee make this excellent value for money. Final Thoughts: With this shed, the manufacturer is proving that substantial garden buildings don’t have to come with a substantial price attached. The overlap cladding gives it a timeless appeal, which can be augmented by the use of a wood stain or shed paint. Whilst this cannot be expected to be as tough and firm as tongue and groove cladding it still looked and felt strong enough to be enjoyed throughout the year. 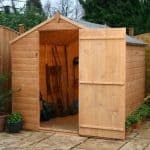 With padlock and alarm systems available as low priced optional extras, this shed can become a great value option for securing your garden tools and equipments, and thanks to its dimensions it can also be used as a bike shed.